It has been a while since we’ve blogged about the Research Data Alliance (RDA), and as an organisation it has come into its own since its beginnings in 2013. One can count on discovering the international state of the art in a range of data-related topics covered by its interest groups and working groups which meet at its plenary events, held every six months. That is why I attended the 13th RDA Plenary held in Philadelphia earlier this month and I was not disappointed. I arrived Monday morning in time for the second day of a pre-conference sponsored by CODATA on FAIR and Responsible Research Data Management at Drexel University. FAIR is a popular concept amongst research funders for illustrating data management done right: by the time you complete your research project (or shortly after) your data should be Findable, Accessible, Interoperable and Reusable. Fair enough, but we data repository providers also want to know how to build the ecosystems that will make it super-easy for researchers to make their data FAIR, so we need to talk to each other to compare notes and decide exactly what each letter means in practice. Amongst the highlights were some tools and resources for researchers or data providers mentioned by various speakers. The Australian Research Data Commons (ARDC) has created a FAIR self-assessment tool. For those who like stories, the Danish National Archives have created a FAIRytale to help understand the FAIR principles. ARDC with Library Carpentry conducted a sprint that led to a disciplinary smorgasbord called Top Ten Data and Software Things. DataCite offers a Repository Finder tool through its union with re3data.org to find the most appropriate repository in which to deposit your data. Resources for “implementation networks” from the EU-funded project GO FAIR, including training materials under the rubric of GO TRAIN. The Geo-science focused Enabling FAIR Data Project is signing up publishers and repositories to commitment statements, and has a user-friendly FAQ explaining why researchers should care and what they can do. A brand new EU-funded project, FAIRsFAIR (Fostering FAIR Data Practice in Europe) is taking things to the next level, building new networks to certifying learners and trainers, researchers and repositories in FAIRdom. That last project’s ambitions are described in this blog post by Joy Davidson at DCC. Another good blog post I found about the FAIR pre-conference event is by Rebecca Springer at Ithaka S+R. If I get a chance I’ll add another brief post for the main conference. Information Services has a new vacancy for a Data Safe Haven Operations Assistant to work directly with the Data Safe Haven Manager in the Research Data Support Team in providing operational support for the Data Safe Haven and its users across the University. This is an excellent opportunity for an enthusiastic researcher or professional to apply their academic and support skills to a growing service area, and to help build and raise awareness of our new Data Safe Haven. You will have research experience and knowledge of current data protection regulations and other relevant legislation in the context of research. You will have an understanding of university structures and norms. You will know how to work methodically and transparently, following and documenting standard operating procedures. You will document and present the service for different audiences to ensure high levels of uptake and engagement with the service. The Data Safe Haven Operations Assistant is a key role in the development and delivery of the new Data Safe Haven component of the Research Data Service, delivered by Library Research Support together with other sections of Information Services. The role allows the post-holder to contribute to defining the way the Data Safe Haven service will operate within the University, including achieving standards-based certifications. This is a fixed-term full-time position for two years. Funded by the Digital Research Services programme, you will be part of a collaborative, engaging, and innovative working environment within Information Services. There are many advantages to working at the University. Benefits include flexible working, an excellent pension, career prospects and generous holiday provision. After extended development, the Research Data Service’s DataVault system is now operational, adding value to research data for principal investigators and their funders alike by offering a long-term retention solution for important datasets. DataVault is a companion service to DataShare, the institutional digital repository for researchers to openly license and share datasets and related outputs via the Web. DataVault comprises an online interface connected to the university’s data centre infrastructure and cloud storage. Each research project can store data in a single vault made up of any number of deposits. DataVault is currently able to accept individual deposits (groups of files) of up to 2 TB each; this will increase over time as project development continues. DataVault is designed for long-term retention of research data, to meet funder requirements and ensure future access to high value datasets. It meets digital preservation requirements by storing three copies in different locations (two on tape, one in the cloud) with integrity checking built-in, so that the data owner can retrieve their data with confidence until the end of the retention period (typically ten years). The DataVault interface helps to guide users in how to deposit personal and sensitive data, using anonymisation or pseudonymisation techniques whenever possible, as prescribed by the University’s Data Protection Officer (DPO). Because all data are encrypted before deposit, they are protected from unauthorised disclosure. Only the data owner or their nominated delegate is allowed to retrieve data during the retention period. Any decisions about allowing access to others are made by the data owner and are conducted outside the DataVault system, once they have been retrieved onto a private area on DataStore and decrypted. Although DataVault offers a form of closed archive, the design encourages good research data management practice by requiring a metadata record for each vault in Pure. These records are discoverable on the Web, and linked to the respective data creators, projects and publications. In exchange for creating this high level public metadata record, the Principal Investigator benefits from the assignment of a unique digital object identifier (DOI) which can be used to cite the data in publications. The open nature of the metadata means that any reader may make a request to access the dataset. The data owner decides who may have access and under what conditions. Advice can be provided by the Research Data Support team and the DPO. DataVault’s workflow takes into account the possibility/likelihood that the original data owner will have left the university when the period of retention comes to an end. Each vault will be reviewed by representatives of the university in schools, colleges or the Library, acting as the data owner, to make decisions on disposal or further retention and curation. If kept, the vault contents become university data assets. The Research Data Support team encourages researchers to plan ahead for data archiving, right from the earliest conception stages of the project, so that appropriate costs are included in bids, and enabling the appropriate steps to be carried out to prepare data for either open or closed long-term archiving. The team can be contacted through the IS Helpline and offers assistance with writing data management plans and making archival decisions. See our service website and contact information at https://www.ed.ac.uk/is/research-data-service or go straight to the DataVault page to learn more about it, get instructions for use, or look up charges. An introductory demo video is available at https://media.ed.ac.uk/media/Getting+started+with+the+DataVault/1_h4r4glf7 . Personal data: What does GDPR mean for your research data? It falls upon me to cover the ‘hot topic’ of research data and GDPR (European privacy legislation) just before a cold winter holiday break. This makes me feel like the last speaker in a session that has overrun – ‘So, I’m the only thing between you and your lunch …’ But none of this changes the fact that the General Data Protection Legislation – codified into British Law by the UK Data Protection Act, 2018 – is a very important factor for researchers working with human subjects to take into account. This is why the topic of GDPR and data protection arose out of the case studies project that my colleagues completed this summer. This blog post introduces the last in the series of these RDM case studies: Personal data: What does GDPR mean for your research data? 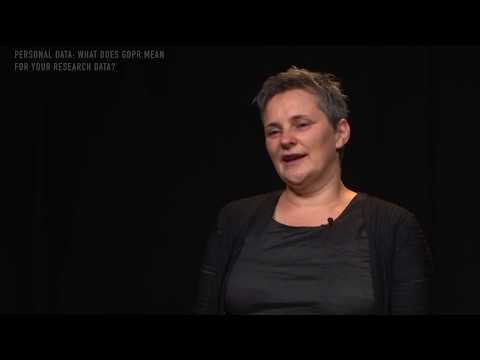 Dr. Niamh Moore talks about how research has evolved to take data protection and ethics into account, focusing on the time-honoured consent form, and the need to take “a more granular approach” to consent: subjects can grant their consent to be in a study, but also to have their data shared–in the form of interview transcripts, audio or video files, diaries, etc., and can choose which of these they consent to and which they do not. Consent remains a key for working with human subjects ethically and legally, but at the University of Edinburgh and other HEIs, the legal basis for processing research data by academic staff may not be consent, it may simply be that research is the public task of the University. This shifts consent into the ethical column, while also ensuring fair, transparent, and lawful processing as part of GDPR principles. I was invited to contribute to the video as well, from a service provider’s perspective because our Research Data Support team advises and trains researchers on working with personal and sensitive data. One of my messages was of reassurance, that actually researchers already follow ethical norms that put them in good stead for being compliant with the Law. Indeed, this is a reason that the EU lawmakers were able to be convinced that certain derogations (exceptions) could be allowed for in “the processing of personal data for archiving purposes in the public interest, scientific or historical research purposes or statistical purposes,” as long as appropriate safeguards are used. Our short video brings out some examples, but we could not cover everything a researcher needs to know about the GDPR – the University of Edinburgh’s Data Protection Officer has written authoritative guidance on research and data protection legislation for our staff and students and has also created a research-specific resource on the LEARN platform. Our research data support team also offers face to face training on Working with Personal and Sensitive Data which has been updated for GDPR. I have tried to summarise how researchers can comply with the GDPR/UK Data Protection Act, 2018 while making use of our Research Data Service in this new Quick Guide–Research Data Management and GDPR: Do’s and Don’ts. Comments are welcome on the usefulness and accuracy of this advice!